Discuss route-specific challenges in optimizing delivery of poorly water-soluble drugs and the techniques used for their formulations and delivery. 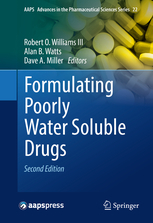 Review analytical techniques to characterize formulations of poorly water soluble drugs. Did you like this lecture? Keep learning!